Essential Opera and I are working together again! I am writing a one-act opera for three sopranos and string quartet entitled December on the theme of relationships, family, travel, and in particular, holiday travel. We are fundraising for this project, with the generous help of a matching grant from the SOCAN foundation. We are about 75% there but need a few extra dollars to make it to our target. And anything above our target will go towards the production itself. Please consider donating to make this opera happen! To read more and donate, please visit essentialopera.com. We are fundraising until February 28th, so we've limited days left to reach our target! Here's some photos from our last collaboration where they premiered "Etiquette" (libretto by John Terauds), a one-act opera about Emily Post, Dorothy Parker and Nancy Astor, featuring excerpts from Emily Post's famous tome "Etiquette in Society, in Business, in Politics and at Home". (Amazingly, that opera was 100% supported through fundraising thanks to our generous supporters). It was an absolute blast, and I can't wait to do another project with them! Coming up on January 18th, pianist/harpsichordist/toy pianist Wesley Shen is premiering my new harpsichord solo toile de jouy as part of a Continuum Contemporary Music/21C collaboration 21C After Hours. The concert will take place January 18, 2019, 10:30 pm Mazzoleni Hall The Royal Conservatory, 273 Bloor Street West, Toronto, ON, CA, M5S 1W2 (tickets here). Such a dream come true to have a work of mine on a Continuum concert (and the 21C festival!) - they are an ensemble I've admired and followed for over a decade. Wesley Shen and I have worked together since 2009 so I'd say we are coming up to our ten-year composer-performer relationship anniversary, and this premiere is a great way to celebrate. Toile de Jouy (or simply “toile”) refers to a type of decorating pattern in which a complex scene is depicted and repeated on a simple, usual white background. It originated near Versailles in the mid-18th Century and was extremely popular, perhaps in part because a ban on cotton in France had just been lifted. The scenes depicted on the fabrics were often pastoral or historical, such as the flight of the first hot air balloon. In toile de jouy, I wanted to explore the complexity and ornateness of this type of design. The textile required a vast amount of creativity and technical detail to pull off - it is perhaps one of the most virtuosic fabrics of its time. The harpsichord is the perfect Versaillesian conduit to embody this rococo textile. toile de jouy is the seventh and final in a set of a multiple-work piece based on the history and associations of various textiles/patterns. Textile Fantasies includes chain maille, for percussion quartet; houndstooth, for solo piano; damask, for toy piano and tabla; denim, for two toy pianos and two percussion; velvet for marimba quartet; and leather for piano and percussion. 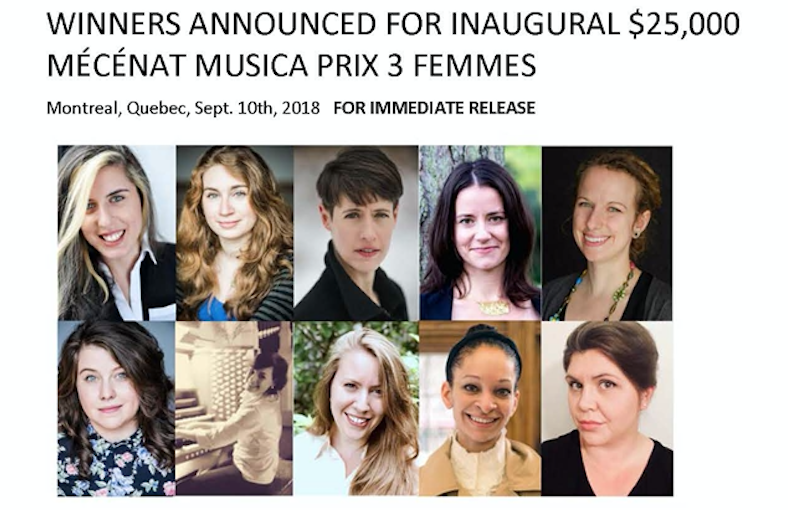 Very pleased to announce that Cecilia Livingston and I have been awarded one of the prizes for the inaugural Mécénat Musica Prix 3 Femmes Prize! 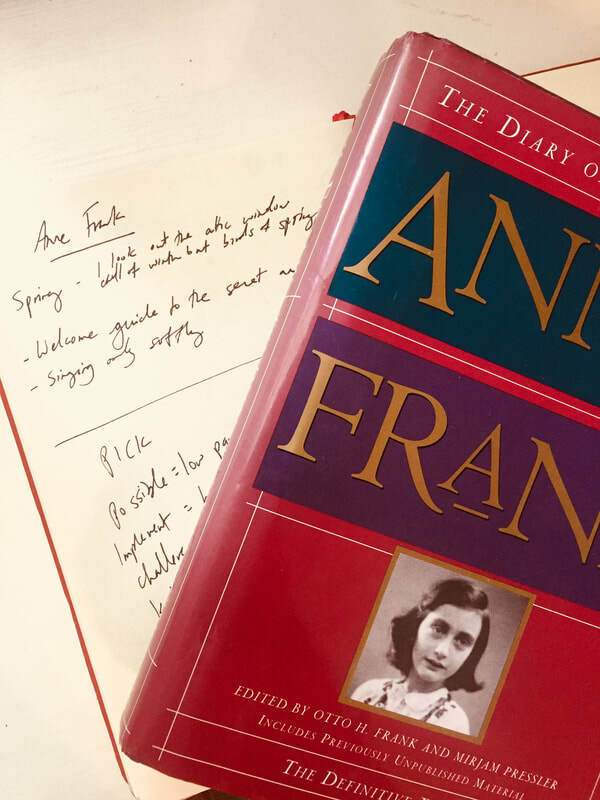 With Cecilia as composer and myself as librettist, we have been working all summer on Singing Only Softly, a dramatic song cycle on the emotional journey of Anne Frank. ​The workshop version is happening in a couple of weeks in Montreal (September 22nd), and then it will have further performances in the spring in Kingston (March 6th) and Toronto (March 19th). While I have been writing my own libretti over the years, and have recently been doing more text for other composers, this is a huge opportunity for my written work and I couldn't be more excited about it, or to be working with such a like-minded, artistically powerful colleague. Great times ahead! Many thanks to the team at Musique 3 Femmes! Mega life move last month - I finally made the move to the United States to join my partner in Baton Rouge, Louisiana. As some of you may know, I came here on a K-1 Fiancé visa, which is a visa that allows you a one-time entry for the specific purpose of getting married. We had applied for this visa last July, and there were so many months of waiting where we heard absolutely nothing, and then in February everything starting happening all at once. To mark this crazy time period, I wrote processing times, a work for the always adventurous chamber group NakedEye Ensemble. Their project - Time's Illusion - is a set of commissions inspired by, and being played in, the National Watch and Clock Museum in Lancaster, Pennsylvania. Coming up this Saturday June 9th! The audio playback from my piece is made up of recordings from the clocks of the National Clock and Watch Museum, including the Tower Clock (1871) and the Master Clock (1927). There is also a jaunty melody from the “Eighth Wonder of the World” L’Engle clock included in the piccolo part (thanks to Bekah Simms for helping me out with my piccolo questions). The final Westminster chimes are recorded from my family’s grandfather clock, which was built in the 80s by my grandfather Francis “Pepe” Clorey. processing times is about how the passing of time has such an slippery, hard-to-grasp feeling – at times incredibly slow and frustrating, and other times ungraspingly fleeting. processing times is also part memento and love song about long-distance love; the title is based off the USCIS current processing times page, something I refreshed daily over months waiting for any news on my K-1 Fiancé visa. whirly for TorQ Percussion Quartet and orchestra is almost here! TorQ and I have worked together many times over the years, and I'm honoured to call them my friends. This coming month is going to be chock full of collaboration - with the support of the Ontario Arts Council, they commissioned me to write a work for them and orchestra for their educational programming, and they are set to premiere it with the Orchestre Symphonique de Montreal on January 29, 30, 31 and February 1st, and then with the Toronto Symphony Orchestra on February 5, 6, 7, 8, and 9th. A little bit about whirly: A quartet of adventurers make an unusual discovery - that simple corrugated plastic tubes are capable of producing a complex and harmonious tapestry of tones when spun wildly. Whirly tubes - also known as corrugaphones, bloogle resonators, tromboons - are rotated quickly to showcase a number of pitches from the harmonic series. The faster the toy is swung the higher the pitch of the note it produces, cycling through a spectrum of overtones in quick succession. Interestingly, the fundamental note of the harmonic series is the most difficult to excite with these unique instruments - leaving an important role for the orchestra to fulfill. Whirly tubes, toy pianos, bells, and more - extraordinary sounds entwine in this escapade for percussion and orchestra. A few days after that, they are giving the Canadian premiere of chain maille, a percussion quartet I wrote for the Sam Houston Percussion Ensemble in Huntsville, TX (under the direction of Jone Lane), on a terrific program of new works with Jason Doell, Cecilia Livingston, Erik Patterson, and Pouya Hamidi (February 20th, The Tranzac). Details here! ​Well, 2016 happened and somehow we made it to the end. It’s been quite a year journeying along with my good friend gender parity. Much of it very good - I am very lucky to work at an organization (The Music Gallery) that values diversity and equity and I’m really proud of the many wee steps we’ve taken over the last year. But of course, many setbacks happened this year as well - most specifically the heartbreak-inducing misogyny surrounding the US presidential election which has left a deep scar on our culture. And on a personal level, I encountered an unexpectedly high number of conversations where I felt like I had to go back to the beginning to explain my perspectives on the barriers that women composers encounter when navigating the new music community, sigh. Rose Bolton: Started an amazing workshop called EQ: Mentorship and Community Building for Women in Electronic Music (with support from Matthew Fava, ally extraordinaire). This is so crucial that it feels like one of those things that should have always existed. It can be so difficult for women to navigate the electronic music field without facing large doses of mansplaining. Also, Rose had an epic premiere with Luminato called Song of Extinction, no big deal. Juliet Palmer: Persevered with the unconventional a cappella opera Sweat which had its premiere run in New York, New York this fall, with plans to tour this coming summer with the always innovative Bicycle Opera Project. Also has been doing amazing interdisciplinary work with her company Urbanvessel. Nancy Tam: An amazing interdisciplinary artist and composer who presented Playback, an immersive soundwalk through the Canadian Music Centre which featured many interviews of Canadian composers. This tremendous work of art uncovers deep and sometimes uncomfortable questions about what it means to be a composer in Canada. Emilie Lebel: Literally the first person I went to school with who has a *full-time* professor position at a university (University of Montana - one can only hope a Canadian university will scoop her up at some point...). In addition to her teaching work, she’s making a ripple internationally with her distinctive and exquisitely crafted music. Ana Sokolovic: While Kaija Saariaho works on the glass ceiling at the Met (tap tap tap), Ana Sokolovic has a commission with the Canadian Opera Company for their 2019-20 season for La Reine-Garçon. I don’t know if I can wait that long. Cheryll Duvall/Ilana Waniuk: Okay, okay - not strictly composers but I would not hesitate to call these two visionaries creators. These two artistic directors - founders of the Thin Edge New Music Collective - have taken some incredible artistic risks this year and they’ve paid off big time. From Balancing on the Edge to their arduous work on their debut album to just constantly commissioning all genders, these two have contributed SO much to what is new and interesting in Toronto new music and we are lucky to have them. Bekah Simms: Special mention to Bekah - not only is she killing it music-wise, she is also the best example I can think of of someone who puts her music out there as much, as wide, and as loudly as possible. It can be a very difficult thing to do - it takes confidence, courage, and perseverance. Also someone who, in collaboration with August Murphy-King, is doing great work with the Caution Tape Collective. Kristel Jax: Not sure if she would identify as a composer or not, but whatever the terminology - there is no creator I know who does more for women in music than Kristel Jax aka Brigitte Bardon’t. She is a support system, she is a safe space warrior, she is listening and believing you and is available for battle. Pauline Oliveros: I cannot believe I was lucky enough to meet her. May her music and outlook resonate in our hearts forever. Each of you, and the many, many more out there who I haven’t listed here - I want to say thank you. You keep us inspired and energized. I can only hope this list is as therapeutic to read as it was to write. Coming up this Saturday October 22, Toronto's newest new music gem the Caution Tape Collective presents a concert of solos for saxophone and harp, with works by Bekah Simms, Patrick Arteaga, Joseph Glaser, Parisa Sabet and Jimmie LeBlanc. My harp solo detach will be premiered alongside its companion piece attach. I collaborated with Toronto's Queen of Harp Angela Schwarzkopf back in 2014 as part of the Toy Piano Composers' concert Tension/Resolution, and we are so excited to present attach/detach as part of Caution Tape's innovative series. Expect smoky textures and ornate patterns. On the same night but different timezone, Jacques Arsenault performs I'll tell you how at the Steel Recital Hall in Charlottetown, Prince Edward Island. 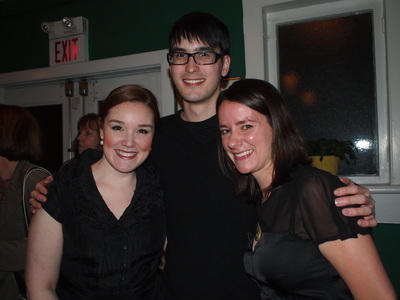 Jacques is a Toronto-based tenor who is originally from PEI, and he has put together a terrific program with PEI-based mezzo Maria Campbell. It's always such a thrill to have any of my works played in my home province, which remains to me one of the most beautiful places on the planet. A few short weeks later on November 13th, Lancaster PA's Naked Eye Ensemble gives the New York premiere of divertimento, my work for projected iPhones, electronics and amplified music box with Tribeca New Music. This work was written for an interactive concert in Scranton, Pennsylvania a couple of years ago (and technically directed by the inimitable Anthony T. Marasco), and I couldn't be happier or more honoured that NEE's Ju-Ping Song has taken a shine to it. Naked Eye Ensemble has commissioned some very interesting works over the years, including one of my personal toy piano favourites, Rusty Banks' Babbling Tower to Tower. Meanwhile, in Vancouver, Barbara Pritchard reprises my piano solo houndstooth on November 19th as part of her Fantasy! program at the Canadian Music Centre's new performance space. This concert is part of a weekend celebrating the music of Barbara Pentland, one of Canada's most important composers. A brief note as I start to slip into vacation mode - here's some photos of some of the amazing performers I've worked with over the past six months. Many thanks to Xenia Pestova/Shawn Mativetsky, Amy O'Dell, Phyllis Chen, the Bicycle Opera Project and Barbara Pritchard for bringing my music to life, from Nova Scotia to California. Big projects coming up in the fall! Couple of exciting composition updates for March and April! Myself and the Toy Piano Composers have been hard at work behind the scenes getting ready to launch our very first festival. 3 venues, 5 events, 11 premieres, and many, many notes! Four original operas that explore travel by bicycle, car and rocketship! Brand-new Operas by: Monica Pearce, August Murphy-King / Colleen Murphy-King, Elisha Denburg, and Tobin Stokes. Immersive audio tour through invisible architectures of Canadian music, inside composers' minds, and into hidden histories within Chalmers House. All things metal, from subatomic make-up to heavy metal-inspired works. Works by Alex Eddington, Ruth Guechtal, Daniel Brophy, Bekah Simms, Chris Thornborrow and Fiona Ryan. Be sure to visit the TPC website to find out more about our exciting programming. 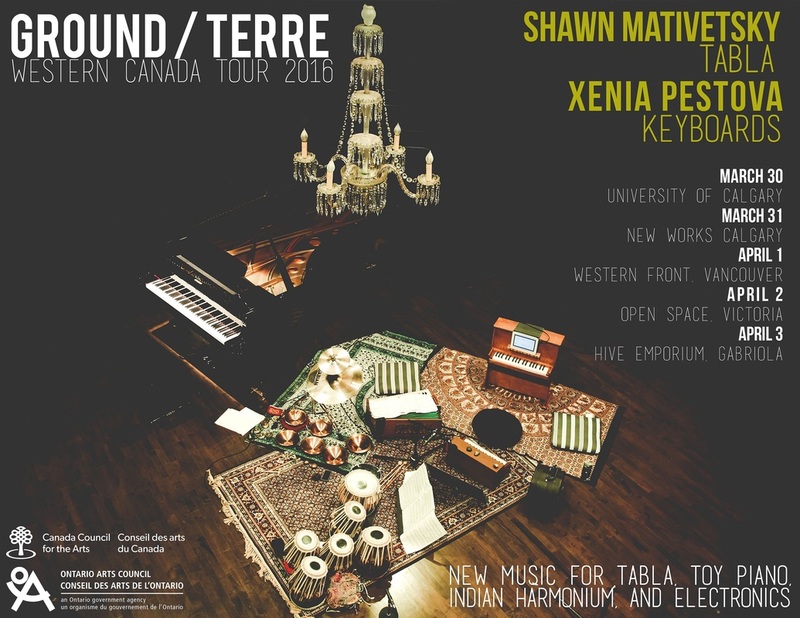 Around the same time but across the country, my new work damask for toy piano and tabla will be premiered by the fantastic duo of Xenia Pestova and Shawn Mativetsky. They are touring a program of works for tabla and keyboard across Western Canada, with stops in Calgary, Vancouver, Victoria and Gabriola. This has been a project in the works for over three years, so I am thrilled to see it come to life, and to have had the opportunity to write for such world-class musicians. from the city of Damascus, the ornamental patterns are often elaborate, involving foliage, fruit, and scrolls. With extraordinary colours, it has been called the world’s most intriguing and luxurious fabric. In modern usage, damask tends to be simpler, but the core element remains the same: it is woven in such a way that the pattern on one side is the inverse of the other. Using a damask pattern as inspiration, the work explores the concept from several angles, by using the pattern as a starting point for the shape of melodic material, and by considering the “personality” of damask as guiding the tone of the piece (luxurious, bold, ornate). In addition, there is a visual element - yards of damask fabric will be on the floor of the stage, setting a striking background to the concept. A couple of updates before I slip into vacation mode + extreme composition writing over the holidays. First! 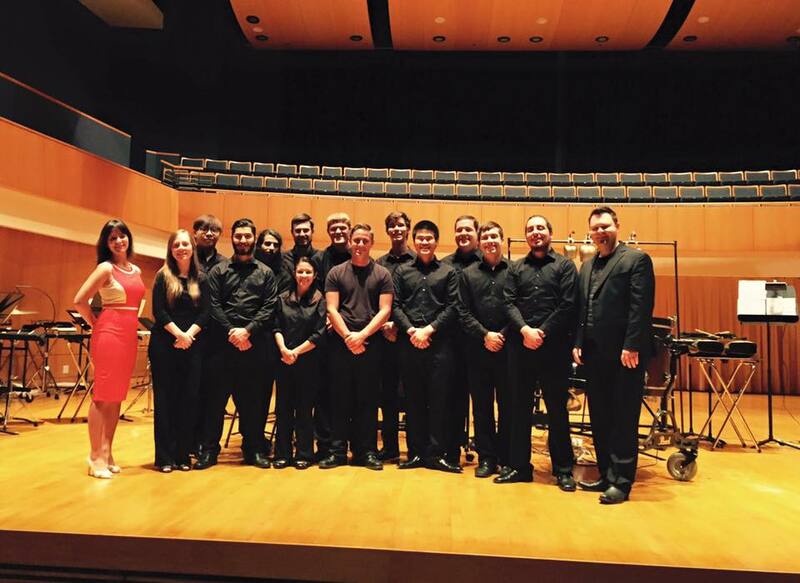 I was so pleased to be able to attend the premiere of my percussion quartet chain maille in Huntsville, Texas in October, where I got to work with the students at Sam Houston State University and get to know percussionist/composer John Lane. John runs a fantastic artist-focused podcast entitled Standing in the Stream and I was lucky enough to be featured as a podguest recently. Check Standing in the Stream out! And many thanks to the Canada Council for supporting my travel to Texas. Second! I'll be heading down to Florida in January for the Florida International Toy Piano Festival. Amy O'Dell will be performing my toy piano and bicycle bells solo clangor, and I'll be sitting on a panel discussion with a bunch of awesome composers (including one of my favourite composers Anthony T. Marasco). A great professional reason to go to Florida in January. 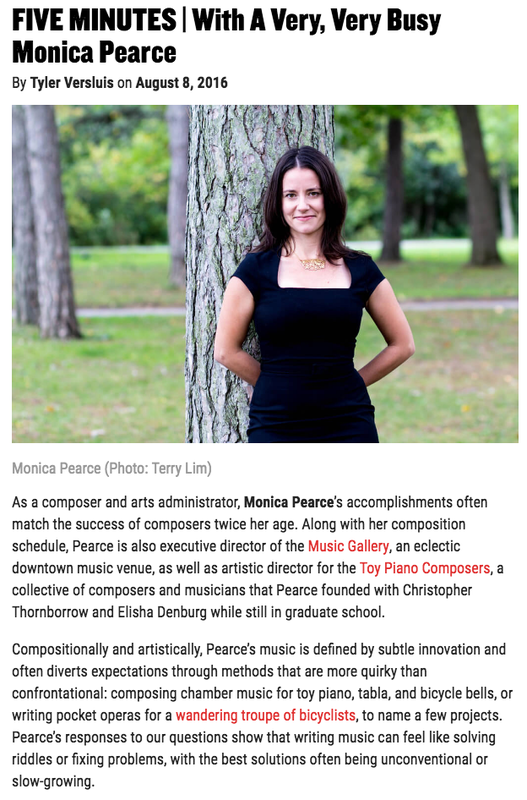 Check out the festival's mini-interview: 5 Questions to Composer Monica Pearce. Third! Also in January I'll be heading to Ottawa for the Canadian New Music Network FORUM 2016. I'll be sharing a talk, "Single ticket sales vs. Subscriptions" with Toy Piano Composers' Director of Marketing and Development Tim Crouch. Don't be fooled by the title - it's a fascinating topic involving audience loyalty, buying trends and risk vs. reward. Two very exciting performances this month, and I'm pretty sure they could not be more different! The first is a three-night run of Etiquette in Ottawa with Opera Lyra (October 16-18th, Great Canadian Theatre Company). I'm so pleased to have my Emily Post-inspired one-act come to life again in the delightful voices of Maureen Batt, Erin Bardua, and Marcia Swanson (swoon!). I've loved Ottawa since I was a kid (skating on the Rideau Canal) and I'm always so pleased when my music gets to visit that fine city. More details on Etiquette/Regina. Soon after, I'm headed south for the premiere of chain maille, a percussion quartet I wrote for the Sam Houston University Percussion Ensemble in Huntsville, Texas (performance on October 29th). This percussion quartet is led by John Lane, a percussionist/composer/educator who also runs a fascinating artist-focused podcast called Standing in the Stream. ​With an exclusively metal timbral palette, this percussion quartet explores the concept of chain maille from several entry points – using the mesh pattern as fodder for musical material, examining associations of its medieval history, and most directly, using a chain maille hood as a percussion instrument. chain maille also investigates the idea of armour – the heavy armour we carry to protect against harm, both physical and emotional. 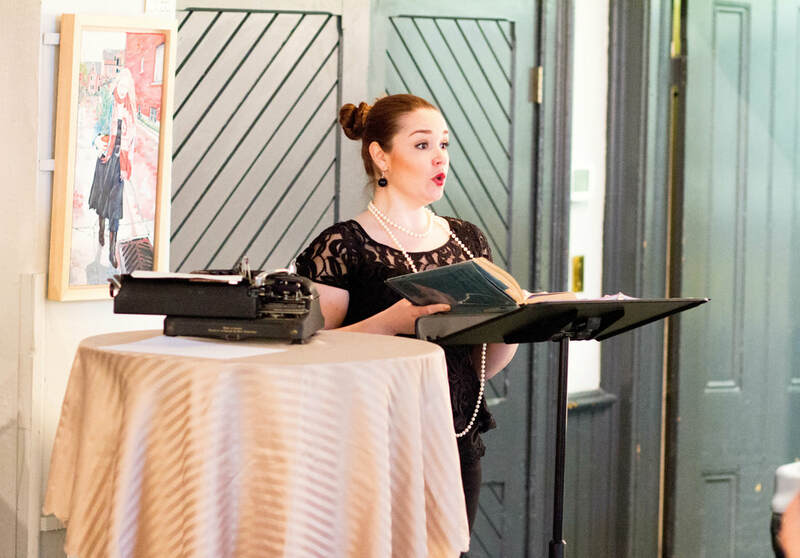 In July, I had the privilege of being one of two composers of the inaugural year of Opera Presto (aka "opera really, really fast") presented by New Fangled Opera in New Orleans. In this completely wild creative adventure, each composer was paired with a librettist (in my case Traix Heiden) and had 16 hours to write a ten to fifteen minute opera, then an extremely talented team of singers had about a day to learn the music. Our opera was entitled Persephone - a sci-fi opera about the first mission to Pluto. Many thanks to the fantastic team who put this together - the organizers Shelley and Chris Burton, librettist Traix Heiden, and our cast Laura Booras, NASA dispatcher; Molly Dahlberg, Seina; Sarah Aragon, Dream Seina; Daniel Foltz-Morrison, Eric; Liliia Oliinyk, piano; and our director Alexander H. Trice. An experience I will never, ever, ever forget! Video to follow soon. I'll be back in the fall with updates on more fun projects - including a premiere in Texas! Leda and the swan. Jerzy Hulewicz, 1928. 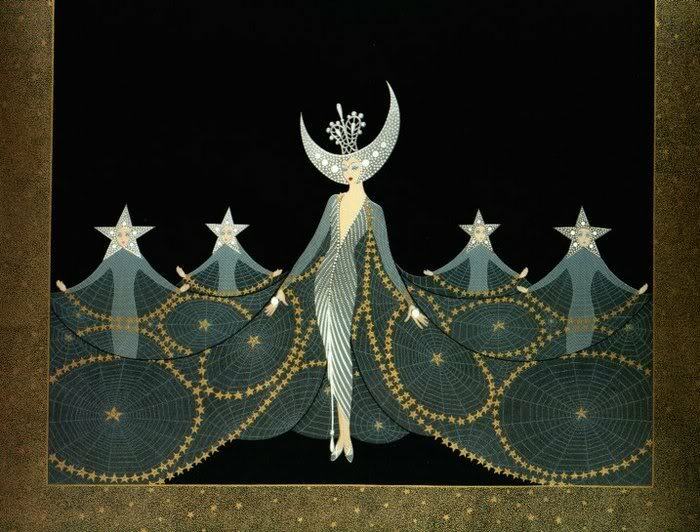 After a few years reveling in the world of opera, I returned to the magical world of art song this winter to write a set of songs on the myth of Leda and the Swan. Using three poems from three different poets - Rilke, H.D., and D.H. Lawrence - the songs explore transformation, seduction, and the balance between fragility and strength. I am thrilled that these songs will be premiered by Toronto's art song + chamber music masters, Talisker Players, with Andrea Ludwig as mezzo. The concert, Heroes, Gods and Mortals, will take place at Trinity St. Paul's on May 12th and 13th, at 8pm. 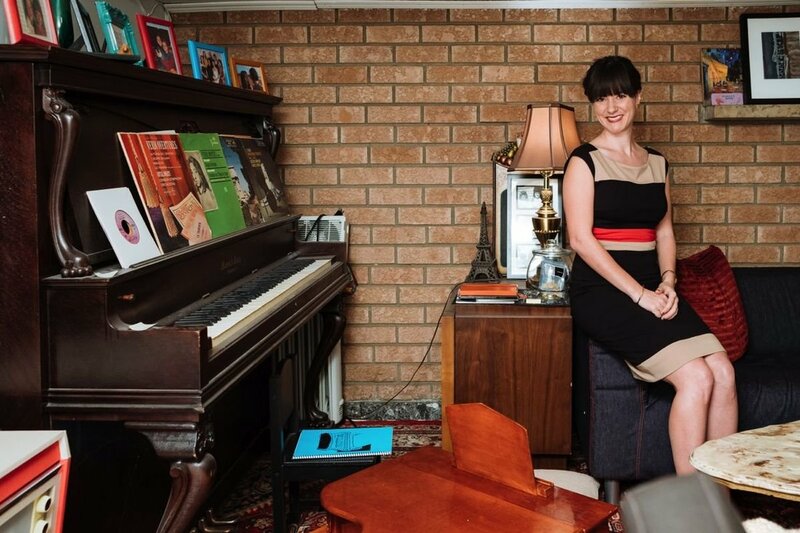 Coming up this week - members of the Toy Piano Composers will be featured as part of Hamilton's What Next Festival in a concert entitled Discover the Unusual. Wesley Shen will be bringing his toy piano and bicycle bells out to Hamilton for a performance of my toy piano solo clangor, alongside a fantastic program including Thornborrow's Walking, James Rolfe's raW, Denburg’s FISHER PRICE LAUGH AND LEARN FUN WITH FRIENDS MUSICAL TABLE and Kaija Saariaho’s Terrestre. April 30th, 7:30 pm, tickets and more info. Later in the month, Aunt Helen, my solo soprano opera based on the life of folksong collector Helen Creighton, will be presented by Opera Nova Scotia on May 22nd and May 23rd in a concert of one-acts. I am absolutely honoured that Opera Nova Scotia chose to include this work on the program Aspects of Woman. My good friend and longtime collaborator Maureen Batt reprises her role as Helen Creighton in the production. Today is one of the first nice days in Toronto after an extremely cold February, and my ears are being serenaded with the beautiful sounds of melting. Love it! A very full and vibrant March is in store for yours truly, with performances from some of my favourite people across three countries (!!). First up, "Queen of the Toy Piano" Margaret Leng Tan takes her program clangor on tour to Australia, playing at WOMADelaide in Adelaide on March 6th and 7th, then off to Hobart for the Tasmanian International Arts Festival on March 10th, and to Melbourne for the Brunswick Music Festival on March 11th. First time any piece of mine has been played in Australia! 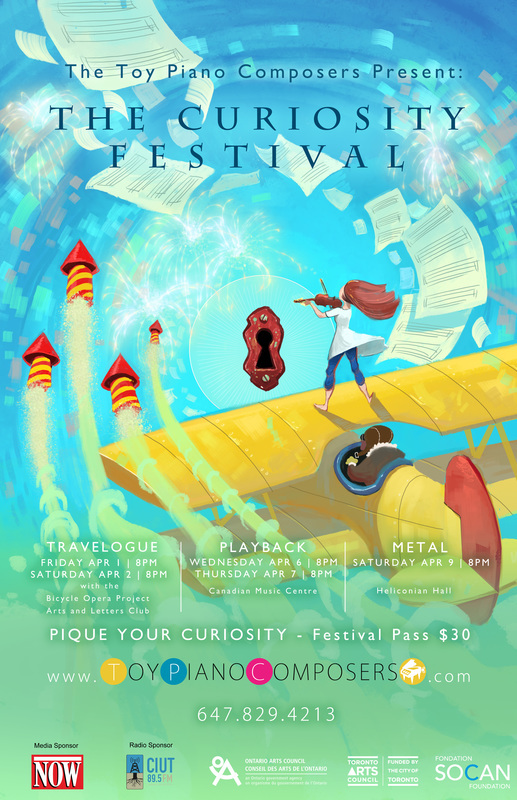 Next up, on March 20th, New Music Edmonton presents their innovative new music festival "Now Hear This", this year focusing on the music of Ligeti. My bass clarinet, piano and percussion trio In the forest, glow. will be presented on the opening night concert by the Violet Collective, alongside works by Gabriel Dharmoo, Emily Doolittle, among others. The whole festival looks fantastic, adventurous programming and lots of really interesting electroacoustic music. Then, on March 21st, soprano Maureen Batt (with pianist Cheryl Duvall) brings her program Crossing Borders to Philadelphia, including the opening scene from Etiquette. I'm delighted to hop along for what will surely be an awesome and memorable roadtrip with Maureen and Cheryl.The concert will also be presented on March 27th in Toronto at Heliconian Hall. Thrilled to announce the release of In the forest, glow. on Centretracks, the digital label of Centrediscs. The piece, which is for bass clarinet, piano and percussion, was recorded live by Halifax-based presenter Musikon Concerts, with performances by Jeff Reilly, D'Arcy Gray, and Simon Docking. It was originally premiered by the Toy Piano Composers Ensemble on the TPC concert Artistic Differences, inspired by Brandon James Scott's Don't Feed the Deer. You can DOWNLOAD the piece on the CMC's website, or directly in iTunes. You can also stream it on Naxos's online library! Many thanks to Allegra Young for her hard work in producing the release, and to Musikon Concerts for such a stellar performance. Happy new year! Lots of fun projects coming up this year, including a song cycle for Talisker players, a toy piano/tabla duo, a solo piano work - can't wait to dive in! For January and February, I have the lucky pleasure of having some repeat performances of some of my absolute favourite works from the past two years. First up is passive aggressive-defensive-contempt-stonewalling, a set of four miniatures I wrote for the TPC Ensemble in 2012. I re-arranged the set to include CelloPhone (Chelsea Shanoff, saxophone and Nadia Klein, cello) for the Toy Piano Composers' upcoming concert Grit on January 24th (more details and tickets). Meanwhile, on that very same evening in Halifax, NS (one of my favourite places), my good friend and frequent collaborator Maureen Batt premieres her Crossing Borders series, a set of concerts featuring a blend of contemporary Canadian and American vocal music. This concert will include the first scene of my one-act opera Etiquette, in which Maureen plays the sharp-tongued Dorothy Parker. (details here). Then, on February 3rd, Acadia University will break out their brand new toy piano with a performance of my quintet connotations as part of their 8th annual Shattering the Silence festival. I wrote connotations for the TPC/Ensemble Paramirabo concert Threshold in 2013, and I am so delighted it will be remounted by Acadia's own NBG Ensemble. Seems to be one adventure to the next these days! Near the beginning of November, I will be the featured composer at the University of Scranton's Art and Music History lecture series event, "Interactive Music: Blurring the Line Between Artist and Audience". For this event, which focuses on the unique nature of interactive, 20th century pieces (think John Cage), I wrote a new work for multiple iPhones, amplified music box and electronics called divertimento. 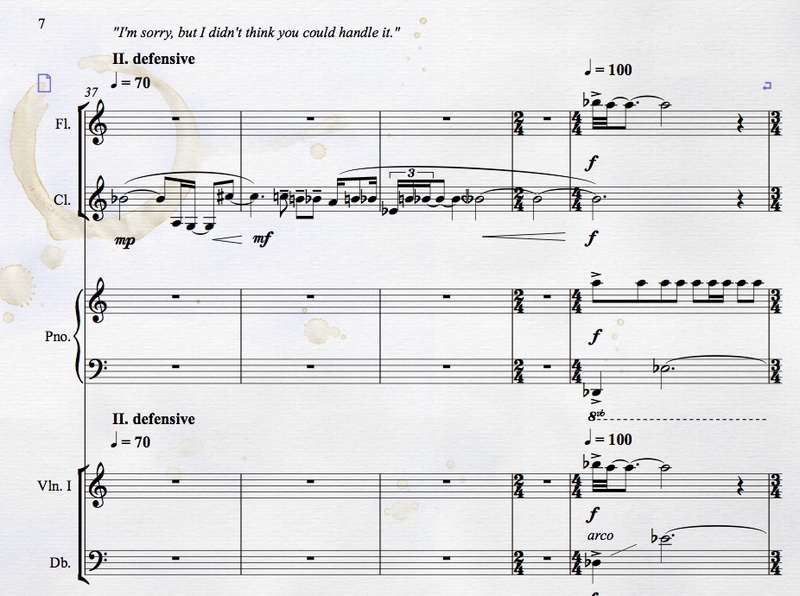 I wrote divertimento as an experiment in how we experience information and beauty in the year 2014. The usual definition of divertimento is as a lighthearted chamber piece designed to amuse audiences. While this work might play a little bit with this expectation, I was primarily interested in an alternate connotation of “divert”, which is to distract, to preoccupy. With music box melodies and overlapping sine waves as a background, participants in the work use cellphones to contribute both audio and visual material in embroidering the work as it unfolds. Then in early December, I'll be headed out to Ottawa for the premiere of my wind band piece vivid with Hawthorne Public School. This work is a part of the University of Ottawa/Ottawa-Carleton District School board "Making Music with Young Musicians" project, which allowed me to travel out several times to work with a bright bunch of grade sevens earlier this year. More details to come! September starts with a fluttery flurry of activity in Monica world - here's what's coming up! Friday, September 5th, TRANZAC, 7:30pm: INTERSection festival kicks off at the Tranzac with a night of performances from Toronto's new music community, including the Thin Edge New Music Collective, junctQín keyboard collective, Kyle Brenders Quartet, the Toy Piano Composers Ensemble, and more. TPC's Wesley Shen will be playing my toy piano solo smart aleck (You can watch the video of the premiere performance of smart aleck with Pascal Meyer here). Sunday, September 7th, Saint Mary's University Art Gallery, Halifax, 7:30pm: I am extremely excited to have my trio for bass clarinet, piano and percussion in the forest, glow. presented as part of Halifax's Musikon concert Entre le chien et le loup. I'll be on the same program as JUNO award-winning composers Allan Gordon Bell and Derek Charke (whoa), and some of Halifax's finest contemporary performers: Simon Docking (piano), Barbara Pritchard (piano), Jennifer Jones (violin), Norman Adams (cello), Jeff Reilly (bass clarinet), and D'Arcy Gray (percussion). (You can watch the video of the premiere performance of in the forest, glow. with the TPC Ensemble here). 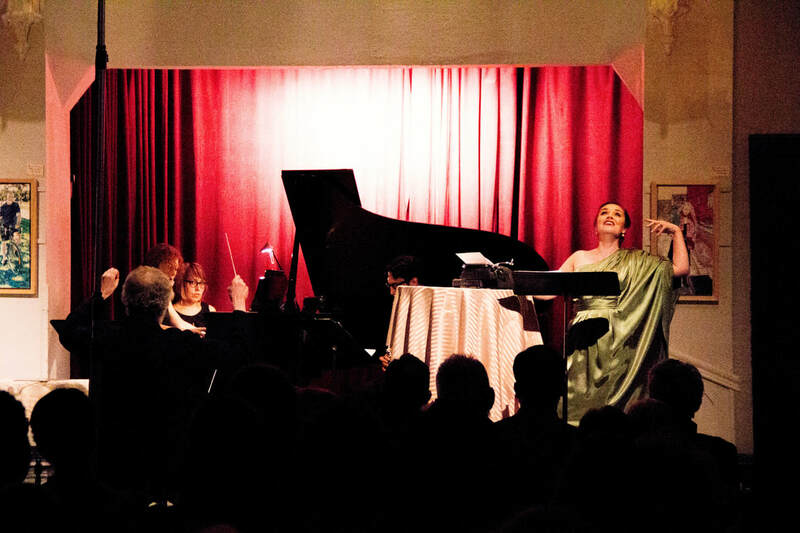 Saturday, September 20th, The Music Gallery, 8:00pm: The Toy Piano Composers season debuts with Pandora's Box, an evening of inventions, oddities, and hidden treasures with visiting composer Anthony T. Marasco. My work, cognitive dissonance, for violin, piano and Oxblood (an invention of amplified spring, designed and built by Marasco) will be remounted alongside a remarkable program of unusual and striking new works. 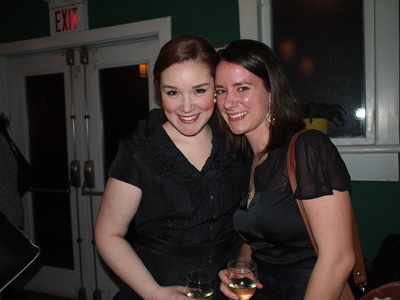 Once upon a time, back in the early 2000s, a young lady (spoiler alert: a brunette) filled with musical dreams arrived in Sackville, New Brunswick to attend Mount Allison University. One look at the Swan Pond and she was smitten. It's hard to believe that it has been 8 years since I left Sackville, the place where I made some of my most lasting friendships, learned and listened to so much amazing music, and (perhaps most importantly!) where I first decided to become a composer. So, it is with so much pleasure and delight that I am returning there this summer to be the composer-in-residence with the O.K. Quoi?! festival. Working with soprano Helen Pridmore and pianist David Rogosin, we'll be presenting a concert of my works on Wednesday, July 30th (4:30 pm, Brunton Auditorium), including several toy piano works (including the Canadian premiere of clangor, for toy piano and bicycle bells), some vocal works and a vocal/toy piano and electronics piece. I'll also be giving an artist talk and leading a soundwalk in connection with the "Sounds of Sackville" soundscape project I'll be working on while I'm there. I am so looking forward to presenting some of my music there; I love when my music is performed on the east coast in general, but there is something extra special of returning to Sackville where the composing all began. For more information on the festival, please visit the Struts website. Into August, the ever-talented Wesley Shen will be featured at Stratford Summer Music with a gutsy program of piano and toy piano music entitled Piano/Play. I was thrilled when Wesley informed me that he had programmed not only one but two of my solo toy piano works, and even more so when he came and played them for me in my living room. 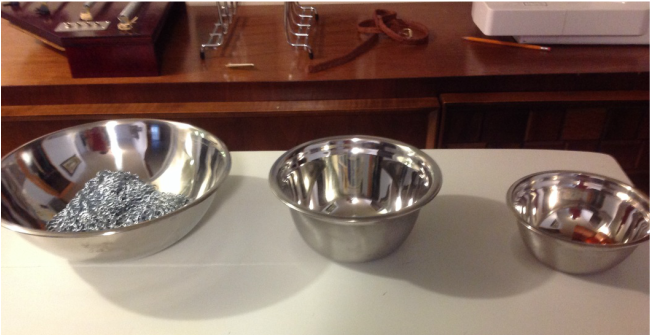 Wesley will be performing smart aleck and clangor, both for solo toy piano. Alongside August Murphy-King, Colin Labadie, Ann Southam, among others, I'm very much looking forward to this inspired program (August 20th, 2 pm, details here). Some upcoming performances and exciting projects to share! First up, next weekend, I'll be travelling out to Prince Edward Island for the performance of emily songs, a set of three art songs with text by Emily Dickinson set around a weather theme. With lyrics like, "...and I said softly to myself, it must have been the sun...", I'm hoping that the sun will listen and show its face after all this...lovely...rain. This PEI performance is part of the program Dreams and Prayers: Susan Gray and the Music of 1864, and will feature performances by soprano Helen Pridmore and pianist David Rogosin, and works by Jane Naylor, Jim O'Leary, among others. Fun fact: Both Helen and David were favourite professors of mine at Mount Allison University. (May 10th, 7:30 pm, Beaconsfield Carriage House, Charlottetown, PEI). Meanwhile, I've been working away on a new piece for the Thin Edge New Music Collective, which will be performed as part of their Premieres III concert on June 13th at the Array Space. Written for the two Artistic Directors, Cheryl Duvall and Ilana Waniuk, cognitive dissonance uses an custom-built invented instrument of amplified springs - the "Oxblood Junior" - in addition to violin and piano. Pictured above is me working on the piece at the Canadian Music Centre, having lots of fun with the Oxblood, which was designed and built by Pennsylvania-based composer Anthony T. Marasco. And then!! On June 15th, Essential Opera reprises our special triple bill Etiquette/Regina/Heather: Cindy + Mindy =BFFs 4EVA at the Open Ears Festival of Music and Sound in Kitchener-Waterloo. I am beyond thrilled to see a second performance of Etiquette, just in general, but especially at a festival that is so innovative and unique. I've got a few things cooking for July and August, including a composery trip out to Sackville, N.B. for O.K. Quoi!? - more details to come! My, oh, my, I have lots of lovely images to share with you today! 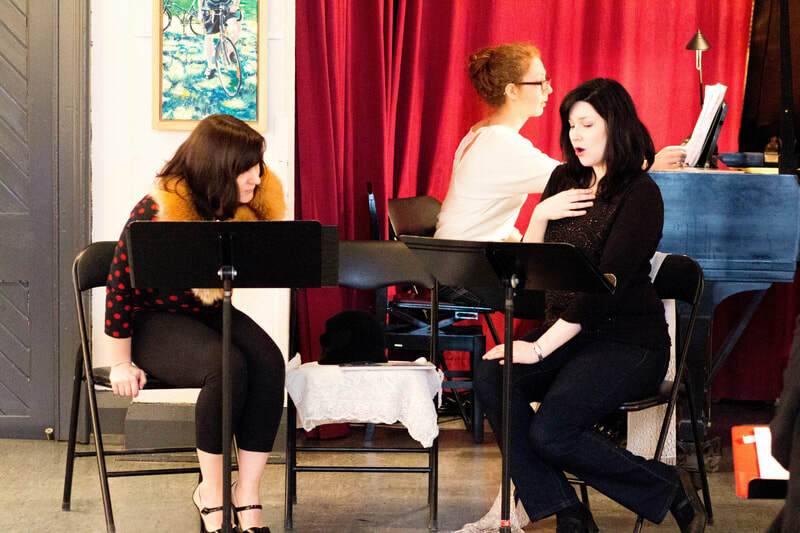 First up - Essential Opera is presenting a triple bill of three new Canadian one-act operas on April 5th (details here), with Elisha Denburg's Regina, Chris Thornborrow's Heather, and my work Etiquette. There are many reasons why this concert is super special, and I will highlight my personal top three. 1) This is my most ambitious opera project to date, 20 minutes of Emily Post, Dorothy Parker and Nancy Astor saying (singing) their opinions about the role of etiquette in society. With a wonderful libretto from John Terauds, this opera was a pleasure to work on and I can't wait to see it come to life. 2) I share this concert program with two of my best friends. Nothing wrong with that. Happy to be in such amazing company, artistically, as always. 3) Singing the part of Dorothy Parker is my soprano muse Maureen Batt - this will mark the fourth piece that I've written for her. One could definitely accuse me of favouritism! What can I say - her voice does something to my music that is beyond, I seem to be addicted to writing for her. A mere week later, the Toy Piano Composers presents Tension/Resolution: New Music for harp and ensemble on April 12th (details here). Featuring the Toronto queen of harp Angela Schwarzkopf, the Toy Piano Composers Ensemble will be playing works by Chris Thornborrow, Elisha Denburg, Fiona Ryan, Nancy Tam, Daniel Brophy, Ruth Guechtal and myself. We are especially delighted to present Daniel Brophy's The Red Sky, which took first place in the 2013 Toronto Harp Society Composition Competition. For this concert, I wrote a work for solo harp entitled attach, which builds off some of my clangorous ideas from the fall (see Music: "clangor") but with some unsettling undertones. Next week, I'll be heading to Calgary for the Canadian New Music Network's biannual FORUM - go business trip! While there, I'll be taking in a myriad of talks, panel discussions, demonstrations, and concerts - can't wait! I'll also be giving a short talk called "Good Housekeeping for Composers: Some Thoughts on Personal Administration", which is based on an article I wrote for the Canadian Music Centre Ontario Region's Notations last summer. You can download the article below, and also check out the full issue of Notations here. 2013 has been a pretty special year, and as it comes to a close, I thought I would take a moment to take stock of some of the great times of 2013. And why not list in a top 5 fashion, a la High Fidelity? 4. Getting my first OAC grant for it plays (because it plays), which directly led to me being able to afford my best creative investment, my piano. 3. Being a part of the New Music for Young Musicians Project, where I got to work with double bassist Alex Kotyk on basement apartments. So fun! Double stop tremelos. 2. Having Dale Sorensen play my alto trombone work Microexpressions not only in Toronto, but in Prince Edward Island. I love when my music comes back home. 1. clangor being chosen as honourable mention for the Uncaged Toy Piano Festival in New York, and way more than that - actually going to the festival! Working with Margaret Leng Tan (pictured above) was such a honour, and meeting all the wonderfully creative composers and performers was truly a highlight. Thanks to everyone who helped make 2013 a fantastically creative year! Fall is here, and with it brings a new, exciting season of concerts! First up is the Toy Piano Composers' fifth year anniversary concert, TPC Turns 5, featuring the TPC Ensemble and the junctQín keyboard collective. I'm really looking forward to this show, as we'll be playing favourite works from the last five years, including my toy piano duo Chess Suite. Moving into November, junctQín will be featured on the CMC's 13th Piano Series, where they will be reprising my six-hand piano trio it plays (because it plays) and works by Aaron Gervais, Alex Eddington, and Alfred Schnittke. To round off the month, fantastic double bassist/educator Alex Kotyk will be premiering my new double bass/piano work basement apartments as part of the CMC's New Music for Young Musicians concert on November 28th. I was starting to think it would never come, but summer is finally here! What I love about summer: long sunny days, cottage time, more time for composing, reduced work hours, and lots of biking. Speaking of biking, the folks from the Bicycle Opera Project are "gearing" up for their 2nd annual Ontario summer tour, which will include shows in Toronto, Hamilton, Guelph, Elora, Fergus, Kitchener, Waterloo, Bayfield, London and finishing up in Stratford. This year, they have a program with works by James Rolfe/Camyar Chai, Lemit Beecher/Liza Balkan, Aaron Gervais/Colleen Murphy, Stacey Brown/Sébastien Harrisson, Juliet Palmer/Anna Chatterton, and myself. I'm delighted that they will be mounting "Cake" in so many cities, brought to life by singers Larissa Koniak, Michelle Simmons, and Geoffrey Sirett, flutist Katherine Watson, and pianist Wesley Shen. Tickets and more info here. In August, I head out to Prince Edward Island for some much anticipated family time, and the second performance of Microexpressions by Dale Sorensen on August 5th in Charlottetown. Have lovely summers everyone! The new performance space at the CMC. An exceptionally busy June is underway with the performance of two of my recently penned (or moused?) works. The first performance, on June 10th at St. Thomas's Anglican Church, was the world premiere of the work I wrote for trombonist and fellow islander Dale Sorensen for his 2nd DMA recital. I composed Microexpressions for alto trombone, an instrument little known as a solo instrument, especially in Canada. With support from the Toronto Arts Council, I wrote the piece as an exploration of the psychological concept of microexpressions, which are brief, involuntary facial expressions shown on the face of humans according to emotions experienced. A few days later on June 13th, the Ontario premiere of Aunt Helen happened at the Canadian Music Centre as part of their 13th Street Winery Piano Series, where delicious Canadian music is paired with equally delicious wine choices. This concert, "Key Characters", also featured works of my fellow TPComposers Fiona Ryan and Elisha Denburg and TPC Ensemble member Adam Scime, and performances by soprano Maureen Batt and pianist Wesley Shen. 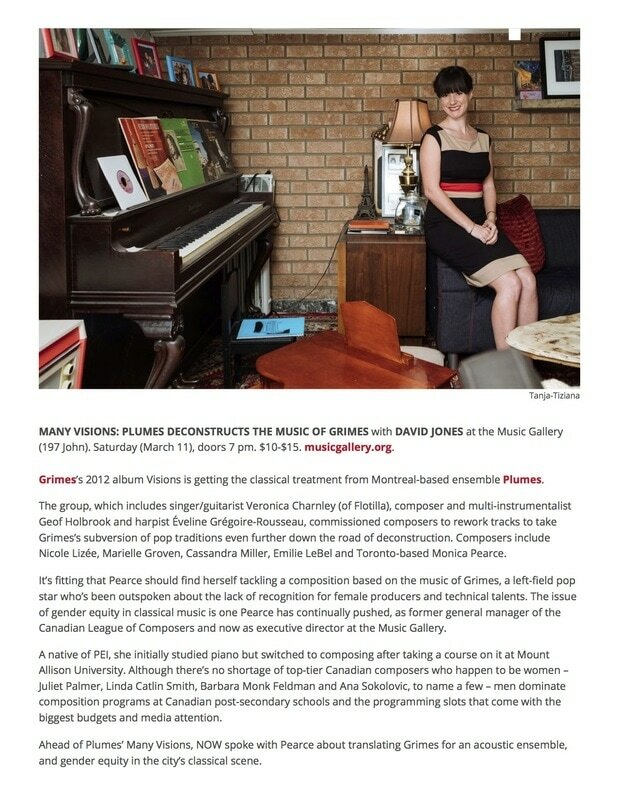 With a kickstart from the CMC Emerging Composer Award (honourable mention) and support from the Ontario Arts Council, I was delighted to unveil "it plays (because it plays" for the junctQin keyboard collective on May 27th, 8 pm at Gallery 345. With a toy piano-inspired electronics component, this six-hand piano trio (or piano triet!) explores the philosophical nature of play. It was a real treat to write for this talented and creative trio again! I'm pleased to announce that two of my choral works were performed in Toronto in April, with two terrific ensembles - Vespera Chamber Choir and the Heliconian Choir and Orchestra. Led by Sarah John, the Vespera Chamber Choir is a women's choir dedicated to performing new choral music, with a special interest in promoting local composers. I'm delighted that they performed my work based on Gwendolyn MacEwen's poem You Know Me. 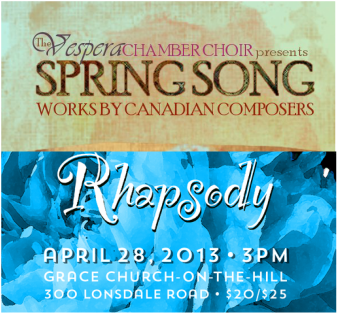 The concert, All-Canadian Spring Song 2013 took place on April 11 at Windemere United Church. This work was originally premiered by the Heliconian Choir and Orchestra, who performed another choral work of mine at the end of April. Also a women's choir, the HCO performed I'll tell you how arranged for flute, piano and choir. The original piece was from a set of three songs for soprano, each based on the poetry of Emily Dickinson. The concert, which also featured works by Jeffrey Smallman, Gershwin and Mozart, took place on April 28 at Grace Church-on-the-Hill. My latest work, connotations, for flute, clarinet, toy piano, violin and cello was recently premiered by Montreal's new music gem Ensemble Paramirabo. Ensemble Paramirabo performed and toured six world premieres by the Toy Piano Composers, with stops in Banff, Regina, Hamilton, Toronto and Montreal as part of the TPC collaborative concert Threshold / Le Seuil. Many thanks to Ensemble Paramirabo for their fine work and outstanding musicianship! A premiere to start off the new year - not bad! 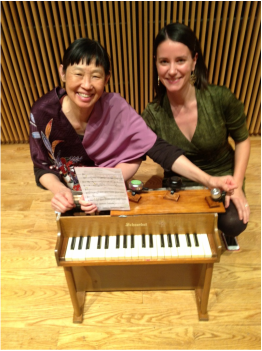 I'm pleased to report that Artistic Differences (February 2nd, 8 pm, Heliconian Hall), was a fantastic success, with six world premieres by the Toy Piano Composers. Inspired by Brandon James Scott's "Don't Feed the Deer", my work In the forest, glow. is a trio for bass clarinet, piano and percussion - a moody yet magical mix. To see the video by Alison Gray, click here. I am delighted to announce that Chess Suite, my work for two toy pianos, was performed in Luxembourg at the Toy Piano World Summit, an international festival dedicated to the toy piano. 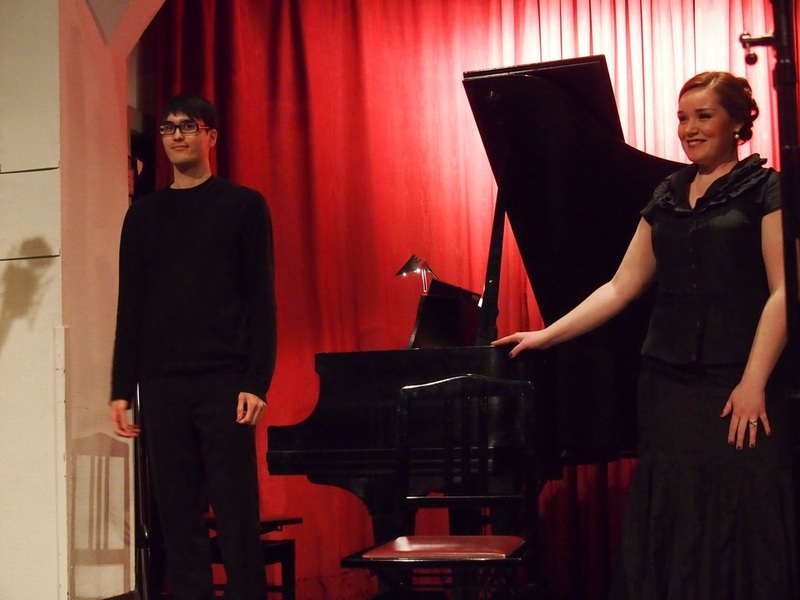 Chess Suite, originally premiered by the junctQin keyboard collective (Elaine Lau, Joseph Ferretti and Steph Chua), was performed by the Pestova/Meyer piano (Xenia Pestova and Pascal Meyer) on December 2, 2012. I am thrilled that Chess Suite was presented alongside works by iconic "toy piano composers" John Cage, Karlheinz Essl, and many, many more! November 2012 -A big thank you to all who braved the ghoulish weather to come out to We Started a Band, the debut of our new TPC ensemble with guest conductor Patrick Murray. It was a fantastic and decidedly convivial start to our fifth season, with a diverse mix of new works that tackled traditional forms including fugues, passacaglias, and miniatures, including the premiere of my new piece passive aggressive – defensive – contempt – stonewalling, a four-movement work depicting the destructive emotions that can unravel the delicate framework of relationships. 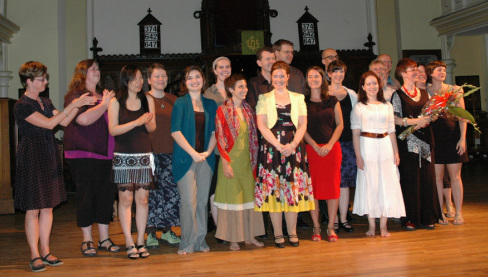 August 2012 - I feel very lucky to have participated in a new workshop for composers and singers entitled "Opera from Scratch", which took place in Halifax, Nova Scotia this summer. For the workshop, I wrote a solo soprano opera, "Aunt Helen", about celebrated folklorist Helen Creighton. Throughout the week, the piece was deeply and intensely workshopped by Maureen Batt, alongside helpful mentors James Rolfe, Janice Jackson, Roberta Barker, Lucy Hayes Davis, Linda Moore, and Simon Docking. "Aunt Helen" was premiered in Halifax alongside five first-class operas from across Canada and the US, and the audience included some of Helen Creighton's relatives! Many thanks to Maureen Batt for her superb interpretation of a Canadian icon. The Canadian Music Centre – Ontario Region is thrilled to announce Emilie LeBel as the winner of this year’s Toronto Emerging Composer Award, with an honorable mention to composer Monica Pearce for her strong showing in the competition. Both individuals will be publicly recognized for their achievement on March 29 at Koerner Hall as part of the Esprit Orchestra’s season finale (for tickets please visit www.espritorchestra.com). discussions the jury arrived at a unanimous decision. work. It does so through a cash prize given to support the creation of a new work specifically intended to benefit the winning composer’s artistic and career development. February 2012 - I am pleased to have been chosen as the winner of the Heliconian Choir and Orchestra's New Music Competition for Emerging Female Composers. 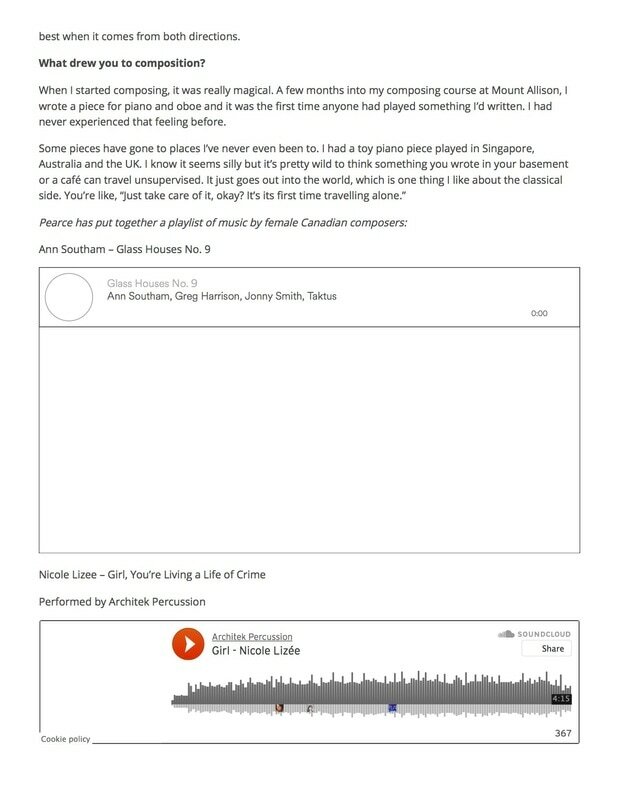 I wrote a piece for the Heliconian Choir and Orchestra entitled "You Know Me", based on a poem by Canadian poet Gwendolyn MacEwen. 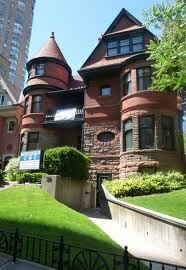 The Heliconian Club, founded in 1909, is a club for women in the arts and letters. The member sections include music, art, dance, literature, humanities and and drama. For more information about the Heliconian Club, visit www.heliconianclub.org.